The biggest party nightmare for anyone is always an empty dancefloor. After all, is it really a party if no one dances? To get things moving, it all starts with a proper dancefloor. In any event the dancefloor is one of the biggest focal points. It essentially sets the vibe and tone of the entire event. If it’s empty or nonexistent, then the event is nowhere near as exciting as it should be. Not every venue is going to have a good dance floor or a proper floor to dance on period. Follow this article for dance floor tips and where to get them for your next event. Start things off by gathering a headcount of who will be in attendance. When it comes to dancing space is super important. Always remember this is a party, not a club. Having enough space is ideal, but it must be the right amount. If the dance floor is too small, people will feel cramped. On the flip side, if the floor is too big your guests might feel self-conscious or weird as if no one’s dancing. A good rule of thumb to follow when picking out the dancefloor of your choice is there should be at least three square-feet of dancing space for every two guests. This is important to communicate to your rental dealer so that the right amount of flooring is available for use at the time of the event. Make sure to further highlight the dancefloor by placing it in the center of the event and seating those individuals who love to dance the closest to the floor. You can feel good that once these people hit the floor, everyone else will feel encouraged enough to follow suit. Dance floors come in a variety of options so pick one that matches your theme and stands out from the crowd. Dancefloors can come in wood, acrylic, vinyl, and even LED to make your party shine. Take it one step further by adding some color or a pattern to make it pop and have your guest say ‘Wow!’ Some people will argue that dance floor lighting is tacky, but an all-white illuminated floor in the right setting is chic and modern. In addition to the floor itself, don’t hesitate to rent lights or projections to increase the aesthetic of the floor. When renting your dance floor, think about the possibilities! Don’t settle for an ugly brown floor that’s too small and poorly positioned within the room. 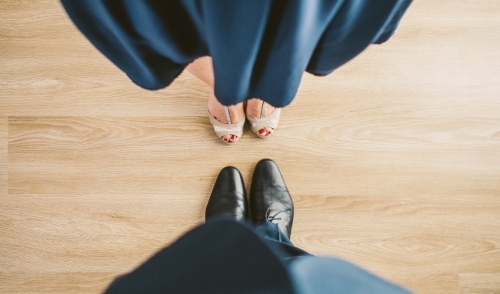 Talk to your rental dealer and grab an affordable dance floor that people won’t forget. I’m talking about the type of dancefloor that will make all of your guests glow with excitement and good vibes. Once the floor is taken care of, just let the music do the rest and bust a move with the people you love. I promise once you hit the floor dancing, all of your guests will have your back.